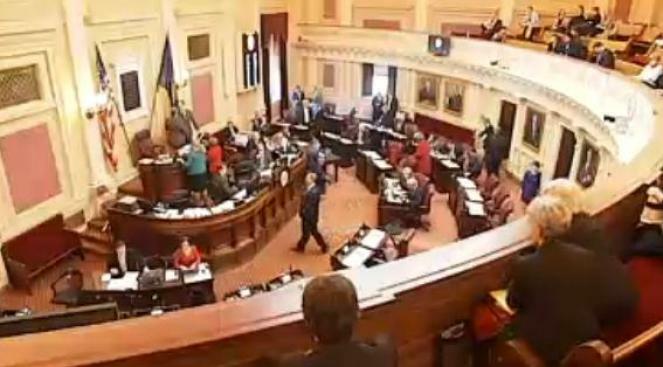 Virginia House Republicans said Wednesday that a budget stalemate could lead to $340 million in cuts to local school districts over the next two years and a freeze on construction projects at state universities. GOP leaders told reporters at the Capitol that the cuts would happen if the General Assembly doesn't pass a budget before July 1 and can't access roughly $675 million from a rainy-day fund. "If we don't have the rainy-day fund then all bets are off,'' said House Appropriations Committee Chairman S. Chris Jones, R-Suffolk. The possible cuts outlined by House Republicans mark the most specific potential reductions in state funding made public since state finance officials warned last month of an unexpected $300 million revenue shortfall for this fiscal year. State lawmakers are set to meet next week to discuss other potential budget cuts in more detail. The GOP-controlled House and the Democratic-controlled Senate are deadlocked on whether the state budget should include an expansion of the state's Medicaid program. Democratic Gov. Terry McAuliffe's spokesman Brian Coy on Wednesday disputed that the state's rainy-day fund would be off-limits if lawmakers hadn't passed a budget by July 1, the end of the current fiscal year. Both McAuliffe and House GOP leaders have reiterated their desire in recent days to avoid setting a precedent by starting the next fiscal year without a budget in place. "Come to the table, negotiate and pass a budget so that we can avoid that,'' Coy said. But there's been virtually no movement by either side on the Medicaid issue since lawmakers adjourned from a special session in March. Ben Kiser, the superintendent of the Gloucester County schools and incoming executive director of the Virginia Association of School Superintendents, said many Virginia school districts depend heavily on state funding and a $340 million in cuts could be ``dire'' for many schools. "There could be significant changes in programs, significant changes in staffing,'' he said.